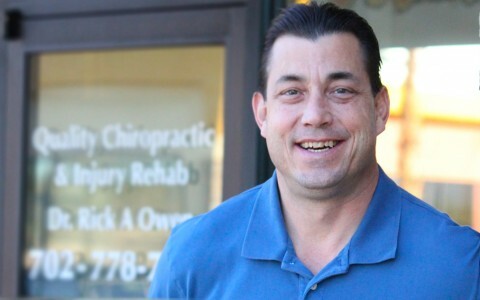 Dr. Rick Owen Las Vegas pain and injury chiropractor provides you lasting relief from chronic lower back pain, neck pain, shoulder leg and knee pain. Are you suffering excruciating pain in your back or neck after a car accident, work accident or sports injury. Ignoring the pain wont make it go away, it will only get worse. Living with chronic pain can affect your quality of life both physically and emotionally. Get pain relief now. Call Dr. Rick Owen to schedule an appointment at: (702) 778-7186. Treatments: Safe, minimally invasive, and clinically proven to be highly effective. Our mission: Effective quality treatment to patients suffering from chronic pain. Quality Chiropractic Injury & Rehab can help. We are conveniently located in the Windmill Lane Plaza, located on Windmill just East of Bermuda. minutes from Las Vegas Blvd, I-215 Freeway and I-15 Freeway.